The classes and methods in the Amazon Kinesis Video Streams Producer SDK do not maintain their own processes. Instead, they use the incoming function calls and events to schedule callbacks to communicate with the application. CallbackProvider: This object exposes every callback from the platform-independent code (PIC) component to the application. This pattern allows full functionality, but it also means that the implementation must handle all of the public API methods and signatures in the C++ layer. StreamCallbackProvider and ClientCallbackProvider: These objects expose the stream-specific and client-specific callbacks, and the C++ layer of the SDK exposes the rest of the callbacks. This is the preferred callback pattern for interacting with the Producer SDK. 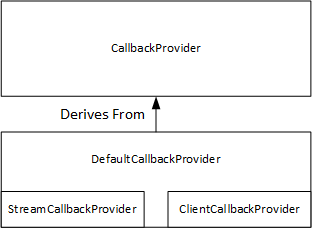 In the preceding diagram, DefaultCallbackProvider derives from CallbackProvider (which exposes all of the callbacks in the PIC) and contains StreamCallbackProvider and ClientCallbackProvider. The ClientCallbackProvider object exposes client-level callback functions. The details of the functions are described in the ClientCallbacks section. getClientReadyCallback: Reports a ready state for the client. getStorageOverflowPressureCallback: Reports storage overflow or pressure. This callback is called when the storage utilization drops below the STORAGE_PRESSURE_NOTIFICATION_THRESHOLD value, which is 5 percent of the overall storage size. For more information, see StorageInfo. For the source code for ClientCallbackProvider, see Include.h. The StreamCallbackProvider object exposes stream-level callback functions. getDroppedFragmentReportCallback: Reports a dropped fragment. getDroppedFrameReportCallback: Reports a dropped frame. getFragmentAckReceivedCallback: Reports that a fragment ACK is received for the stream. getStreamClosedCallback: Reports a stream closed condition. getStreamConnectionStaleCallback: Reports a stale connection condition. In this condition, the producer is sending data to the service but is not receiving acknowledgements. getStreamDataAvailableCallback: Reports that data is available in the stream. getStreamErrorReportCallback: Reports a stream error condition. getStreamLatencyPressureCallback: Reports a stream latency condition, which is when the accumulated buffer size is larger than the max_latency value. For more information, see StreamDefinition/ StreamInfo. getStreamReadyCallback: Reports a stream ready condition. getStreamUnderflowReportCallback: Reports a stream underflow condition. This function is not currently used and is reserved for future use. For the source code for StreamCallbackProvider, see StreamCallbackProvider.h. The ClientCallbacks structure contains the callback function entry points that the PIC calls when specific events occur. The structure also contains version information in the CALLBACKS_CURRENT_VERSION field, and a customData field for user-defined data that is returned with the individual callback functions. version: The version of the struct. callAfter: An absolute time after which to call the function. timeout: The timeout of the operation in 100 nanosecond units. customData: A user-defined value to be passed back to the client. pAuthInfo: The credentials for the call. For more information, see the following (__AuthInfo) structure. version: The version of the __AuthInfo structure. type: An AUTH_INFO_TYPE value defining the type of the credential (certificate or security token). data: A byte array containing the authentication information. size: The size of the data parameter. expiration: The expiration of the credentials in 100 nanosecond units. The Kinesis Video Producer SDK provides the status of streaming through callback functions. It is recommended that you implement the following callback mechanisms to recover from any momentary network issues encountered during streaming. Stream latency pressure callback - this callback mechanism gets triggered when the SDK encounters a stream latency condition. This happens when the accumulated buffer size is larger than the MAX_LATENCY value. When the stream is created, the streaming application sets MAX_LATENCY to the default value of 60 seconds. The typical implementation for this callback is to reset the connection. You can use the sample implementation at https://github.com/awslabs/amazon-kinesis-video-streams-producer-sdk-cpp/blob/master/kinesis-video-gstreamer-plugin/plugin-src/StreamLatencyStateMachine.cpp as needed. Note that there is no option to store the frames undelivered due to network outage into a secondary storage for back-fill. Stream staleness callback - this callback gets triggered when the producer can send data to the AWS KVS service (uplink) but it’s not able to get the acknowledgements (buffered ACK) back in time (default is 60 seconds). Depending on the network settings, either the stream latency pressure callback or the stream staleness callback, or both can get triggered. Similar to the stream latency pressure callback retry implementation, the typical implementation is to reset the connection and start a new connection for streaming. You can use the sample implementation at https://github.com/awslabs/amazon-kinesis-video-streams-producer-sdk-cpp/blob/master/kinesis-video-gstreamer-plugin/plugin-src/ConnectionStaleStateMachine.cpp as needed. Stream error callback - this callback gets triggered when the SDK encounters a timeout on the network connection or other errors during the call to the KVS API service calls. To recover from network timeout errors, you can refer to and use the sample implementation for recreating the stream at https://github.com/awslabs/amazon-kinesis-video-streams-producer-sdk-cpp/blob/master/kinesis-video-gst-demo/kinesis_video_gstreamer_sample_app.cpp#L1023 . Dropped frame callback - this callback gets triggered when the storage size is full either due to slow network speed or a stream error. If the network speed results in dropped frames, then you can either increase the storage size, reduce the video frame size or frame rate to match the network speed.